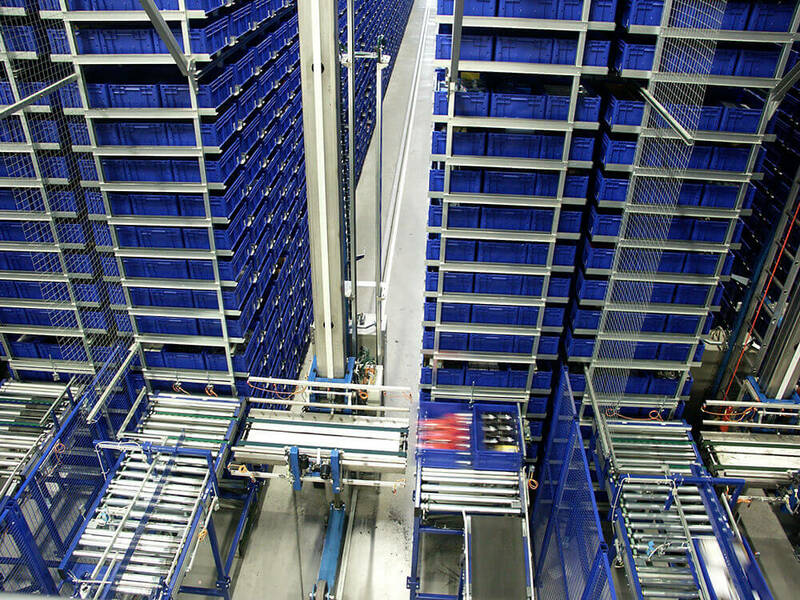 Automated storage systems play a central role in an intralogistics system, efficiently storing a large proportion of stock in minimal space. KNAPP is the leading provider of innovative shuttle systems. Smart solutions based around the OSR Shuttle™ and the YLOG-Shuttle provide answers to the current challenges and trends in intralogistics. 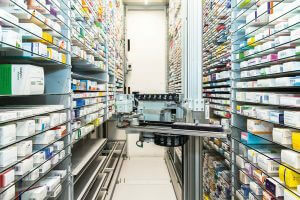 KNAPP-Store and Industore can efficiently store and pick single items from a wide range of articles. 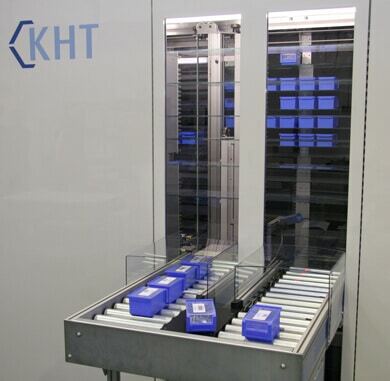 Individual tablets can be stored and picked with the KMeD – the solution especially developed for the pharmaceutical supply chain. Flexible storage towers and traditional solutions with stacker cranes complete the KNAPP group’s warehouse technology portfolio. Smart Shuttles are KNAPP’s answer to the latest challenges and trends in intralogistics. Flexible, scalable, expandable, efficient, ergonomic, economical, and precise – Smart Shuttles open up new dimensions in intralogistics. KNAPP has shuttle solutions that cater to all possible requirements in the warehouse. Each solution can respond to new challenges and grow together with the business. The Smart Shuttles can be seamlessly integrated into the system as a whole, with customized software and ergonomic work stations. What is an all-in shuttle? KNAPP has applied its motto making complexity simple to the world of Smart Shuttles with its all-in shuttle concept. Making complexity simple means making complex tasks manageable. 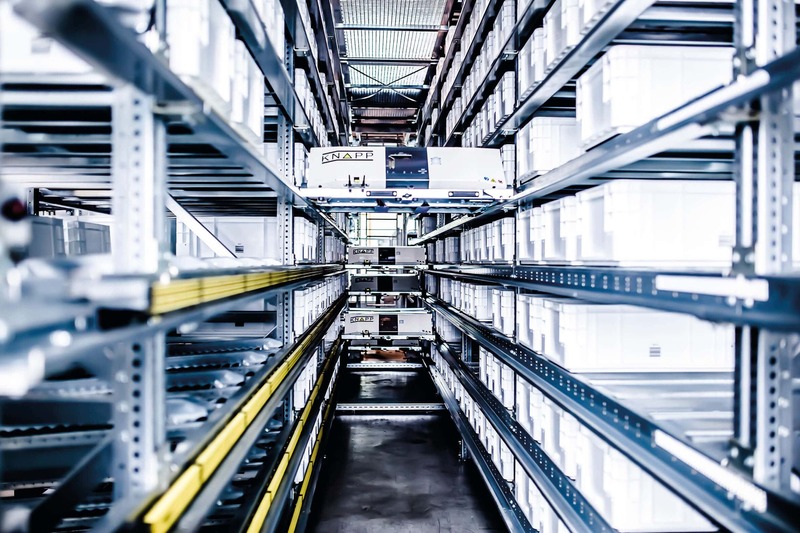 Storage, picking, buffering, sequencing, replenishment and supply; the all-in shuttle simplifies and consolidates a multitude of warehouse processes. OSR Shuttle™ Evo: Welcoming change! The world is changing. Sometimes changes are abrupt, other times, changes develop slowly over time. One thing is for sure – changes always bring with them new challenges. Some of the challenges we are currently facing include the limited predictability of business developments as well as high demands for performance and quality. It’s challenges such as these that drive us forward in finding new solutions and developing existing solutions to provide you with a decisive competitive advantage. After careful development, building on over 15 years’ experience, market expertise and innovation, we are proud to present the new generation of shuttle systems – the OSR Shuttle™ Evo. The OSR Shuttle™ is essentially designed as a storage and picking system and is uniquely versatile. The OSR Shuttle™ is essentially designed as a storage and picking system and is uniquely versatile. The OSR Shuttle™ forms the very heart of an intralogistics system. It efficiently stores a wide range of articles in minimal space. An all-in-one system, the OSR Shuttle™ contains racks, shuttles, lifts, and a pre-zone, as well as customized software. Safety is top priority with the OSR Shuttle™. As a result, it’s completely surrounded by a safety fence and is equipped with a special access monitoring system. The OSR Shuttle™ is a modular system available in different designs. What’s more, each OSR Shuttle™ is also adapted to suit individual customer requirements and processes. 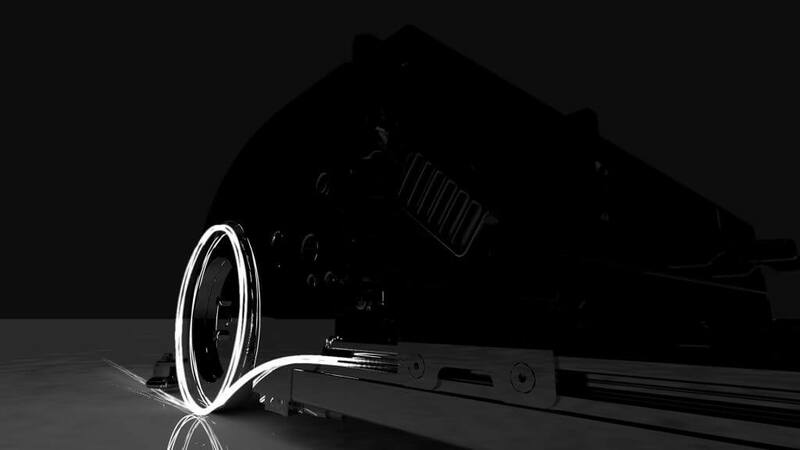 KNAPP is the leading provider of innovative shuttle technology. But what is so special about the OSR Shuttle™? 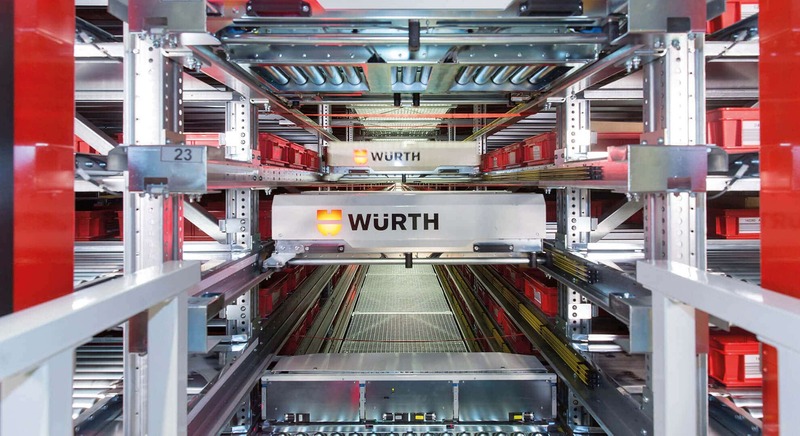 The fact that horizontal and vertical conveyance are independent of one another – each shuttle serves a single level in the rack. This increases the performance of the OSR Shuttle™ as well as making it more flexible than conventional stacker cranes. The shuttles move independently of each other, guaranteeing maximum availability. Each shuttle serves a specific level in the rack line system where they store and retrieve load carriers (containers, cartons or trays). The load carriers, with contents weighing up to 50 kg, can be stored one behind the other, wherever there are free storage locations. High-performance lifts convey the load carriers to the pre-zone. The lifts then take the load carriers and convey them from the pre-zone to the allocated level. Adjustable telescope arms place different sized containers, trays or cartons directly into the rack for storage. All this makes the OSR Shuttle™ a space-saving, efficient and flexible storage system for a wide range of articles, in which the articles can be accessed at any time. 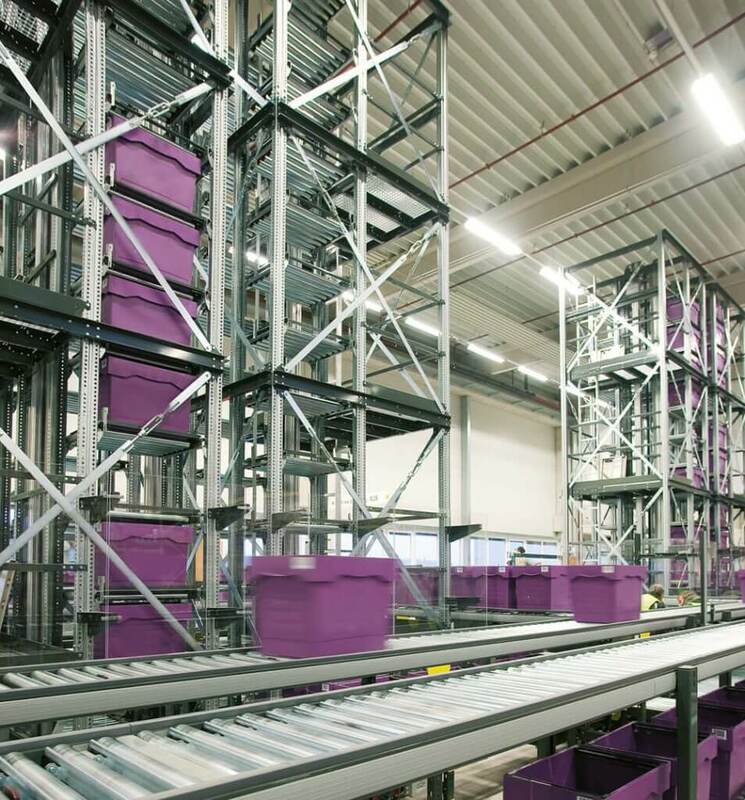 The KNAPP-Store is an innovative storage and picking system that can be used along the entire pharmaceutical supply chain, whether in wholesale or for online pharmacies. The KNAPP-Store is an innovative storage and picking system that can be used along the entire pharmaceutical supply chain, whether in wholesale or for online pharmacies. The KNAPP-Store can store diverse articles effortlessly and occupies minimal space. It automates a wide spectrum of articles that would normally require a great deal of manual processing, with manageable investment costs and low costs per storage location. Scalable dimensions and the use of a resilient robot increase quality and efficiency as well as providing maximum storage density using a minimum amount of space. The flexibility and performance required to respond swiftly to ever-changing demands are then available when needed. Moreover, the KNAPP-Store also meets the documentation requirements specific to the sector (lot tracking, serial number tracking, date mark) for single items. A standard KNAPP-Store has a scalable rack line with glass shelves for maximum storage density, a reliable two-arm gripper system, a storage work station, output chutes as well as a customized software solution. There are several KNAPP-Store variants catering to different requirements and processes. The KNAPP-Store is an efficient and safe automation solution for a wide range of articles, whether that be medium movers, slow movers, returns, special articles or e-commerce orders. Articles that are not usually compatible with automated systems, such as cans and pots can be cleverly automated. The KNAPP-Store stores articles multi-deep on glass shelves to best use the available space. Articles enter the system automatically on a storage conveyor. The serial and lot numbers are also registered by the KNAPP-Store during the goods-in process, along with the date mark. A robust two-arm gripper system works ambidextrously to handle picking, storage and relocation. It can access all storage locations. The Industore is an efficient and versatile storage and picking solution. The Industore is an efficient and versatile storage and picking solution. The Industore is based on the KNAPP-Store but is intended for use in industry. The Industore provides secure storage using minimal space and efficiently handles single items from a wide range of articles. The Fastbox is a fast storage and buffer tower with an integrated lift system. It is usually connected to a Pick-it-Easy work station. The Fastbox is a fast storage and buffer tower with an integrated lift system. It is usually connected to a Pick-it-Easy work station. It is the ideal addition to a storage system like the OSR Shuttle™ and has diverse applications. Just like the shuttle systems, the Fastbox is scalable and built around the proven principle of parts commonality. It processes containers, cartons and trays. The Fastbox complies with the strictest security standards in the same way as the OSR Shuttle™ and also has a standard energy concept. The storage system portfolio also includes stacker cranes. 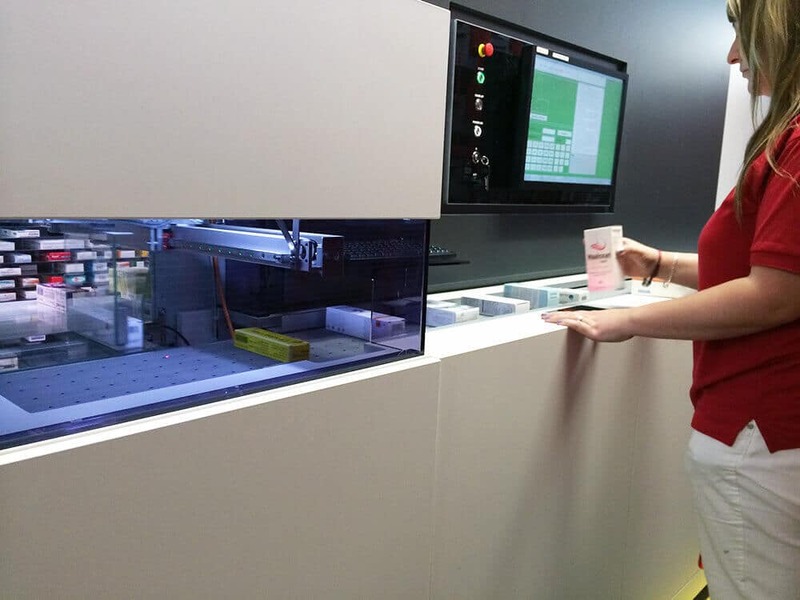 KNAPP provides all-in-one solutions for containers, cartons and pallets including software. The KNAPP storage system portfolio also includes stacker cranes. KNAPP provides all-in-one solutions for containers, cartons and pallets including software. KNAPP has many years of experience in implementing high-performance stacker crane solutions and has put hundreds into operation around the globe. Such projects can be huge; the rack line systems for pallet stacker cranes can be over 200 m long and 30 m high. High-bay racking, silo type constructions and designs for use within a hall are available. The stacker cranes store diverse load carriers such as pallets, containers, trays and cartons in single and multi-deep racks. The stacker cranes are ideal for use in a cooling and cold-storage area. Besides efficiently storing goods, the stacker cranes can also supply flow racks when required. The KNAPP’s stacker cranes are characterized by their energy efficiency and intelligent energy management. KiSoft or SAP® EWM by KNAPP handle stacker crane control, completing the all-in-one solution from a single source. The KNAPP Medication Dispenser (KMeD) is an innovative automation solution for fast, efficient and accurate picking of patient-specific orders into vials. The KNAPP Medication Dispenser (KMeD) is an innovative automation solution for fast, efficient and accurate picking of patient-specific orders into vials. The KMeD is particularly effective when used for medium and slow-moving medicinal articles. It is a complete picking solution that includes specialized software and protects patient safety while still guaranteeing efficient order processing. The KMeD is ideal for use in production, wholesale and for Direct2Patient applications, where order fulfilment involves individual tablets for specific patients. Prescriptions are picked reliably on an individual basis, reducing the time and resources usually required to achieve that level of quality. The KMeD is the ideal addition to the proven Automatic Tablet Dispenser (ATD) and is characterized by its high level of flexibility, ease of integration and precise order fulfilment. The KMeD is essentially a scalable rack line system equipped with dispensers, meaning it can be individually adapted to requirements and available space. Depending on the system design, up to 900 vials per hour can processed automatically. An articulated arm robot takes care of automatic replenishment, ensuring an even rate of order processing. RFID technology guarantees maximum process reliability and transparency by identifying and verifying storage locations and medicines.